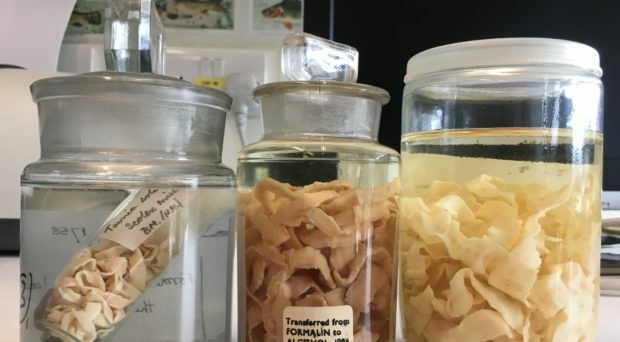 Three tapeworms from the NHM collections, from left to right: Taenia solium – from a man who had eaten undercooked pork. Taenia saginata – passed by a Seaman in 1940 after eating undercooked beef. Diphyllobothrium latum – passed by a Finish man from eating uncooked fish. The point in time at which our early ancestors expanded their diet of nuts and berries to a more diverse range of nourishment, could also be labelled as the birth of the ever-expanding cuisine we know and love today. Pondering what we eat, when we eat it and how it should be prepared and consumed is one of the human races essential, yet also favourite, past times. However, our association and changing habits with food has brought with it the presence of an incredibly complex, fascinating, and usually unwelcome, parasitic dinner guest. Parasites are intertwined with many culinary delights, and in fact a large proportion of the parasites that infect humans and other animals are acquired orally, and for the most part accidentally with the exception of eager parasitologists or those wrongly believing that they could offer a safe and easy weight loss agent. After discussions with members of the public visiting our table, here are a few examples that created particular interest, and also some common misconceptions. We displayed a few parasites reported in the American Society for Parasitologists Presidential address by Robin M. Overstreet as being eaten for pleasure (please see this address for further examples). 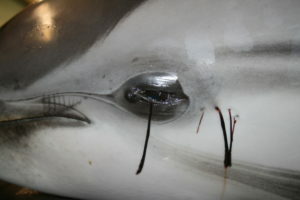 The blood feeding parasitic copepod Pennella balaenopterae can be found embedded in the flesh of many marine mammals, the “plump and juicy” body of which are “plucked from the host and eaten raw, and the ‘sweet’ contents of the blood filled neck are sucked out” by Arctic Inuits. 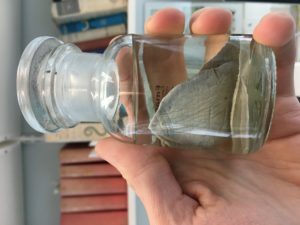 Another Inuit practice some may consider less unusual is the consumption of live Botfly larvae taken directly from the hides of skinned caribou, a light snack reported by Robert Rausch as being “quite palatable”. A moderately sized giant liver fluke Fascioloides magna, removed from liver of a red deer (Cervus elaphus) from south Slovakia. 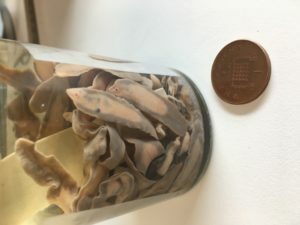 Giant liver flukes, Fascioloides magna, found in fibrous capsules within the liver of deer and other such herbivores of North America and Northern Europe are also believed to have once been consumed by hunters and others with great pleasure, potentially by double frying these relatively large parasites to produce a “puffy speciality”. Most members of the public had at least an inclination that tapeworms can be acquired by ingesting undercooked beef or pork infected with the larval cysts of Taenia saginata and T. solium respectively. However, none were aware of the potentially deadly or life-changing effects that ectopic infections can have on humans, such as echinococcosis caused by ingestion of tapeworm eggs of the genus Echinococcus typically found in dog faeces (usually consumed accidentally). The parasite is unable to undergo its usual lifecycle in the human host, and instead forms hydatid cysts / parasite tumours in various organs throughout the body including the brain, which if critical have to be surgically removed (Warning: video depicts removal of hydatid cyst from the head of a patient, not for the faint hearted). Another extremely abnormal tapeworm infection has also been reported in an immunosuppressed (due to HIV infection) individual, where genetically altered tapeworm cells proliferated and presented as cancerous. Many of the public visitors quickly noticed the tray of sushi sat nestled in between our less appetising specimens. Why? Traditional Japanese (e.g. sushi, sashimi), Peruvian (ceviche), European (e.g. carpaccio, marinated herring, gravalax) and many other raw fish dishes are becoming more popular globally, generally due to the ideally healthy sustenance such a meal can provide. Aside from the various bacterial and viral pathogens one can acquire from the consumption of raw fish, parasitic roundworms such as Anisakis spp. and Pseudoterranova spp., and parasitic tapeworms of Diphyllobothrium spp. can also be found in commonly eaten fish like salmon, herring, cod, pollock and mackerel. The clinical pathology observed during human infections can range from symptomless to severe, but is mainly associated with a mixture of gastrointestinal symptoms that can be confused with other ailments. As raw fish dishes continue to grow in popularity, it is likely that we will frequently hear stories of Californian sushi-lovers passing tapeworms, read more public health warnings to pay closer attention to what fish we are eating, and learn how to ensure adequate freezing to kill fish parasites. (N.B. a hungry parasitologist consumed the ‘display sushi’ after the event was over!). With growing concerns of climate change, health and animal welfare, there has been a sharp rise in vegetarianism and veganism over the past few years, several of these recent converts expressing their relief to me knowing that not eating meat and fish saved them from several parasitic infections. The parasites of public health importance discussed so far (ignoring ectopic infections) are all acquired by eating meat or fish, however parasitic Digenea of the genus Fasciola (liver flukes), unlike other foodborne trematodes are acquired by humans from eating encysted metacercariae on raw/insufficiently cooked aquatic plants such as watercress, or even by directly drinking untreated freshwater. There are many outstanding gaps in our knowledge of the foodborne trematodiases when compared to many of the other Neglected Tropical Diseases, meaning for example that the lifecycle of parasites causing Paragonimiasis in Africa are still not completely elucidated. Just from these few specimens, we were able to discuss some remarkably diverse parasitic lifecycles in relation to the food we eat, and all without even mentioning some of the protozoan parasites that can also be on the menu. With the upkeep of our sophisticated palates, we should keep in mind the risks associated with some of the foods we love to eat.